How you wish to begin is up to you. Hidaka USA, Inc. understands that new product development is a subject of closely guarded proprietary information. We are therefore ready to assist you with the strictest confidentiality of your information in mind. Prospective clients often begin with a visit to our headquarters to better understand how our capabilities match their prototype and/or mass production needs. We welcome the opportunity to schedule an appointment, so don’t hesitate to contact us. We are here to solve... here to serve. Parts Come First Because Clients Come First. 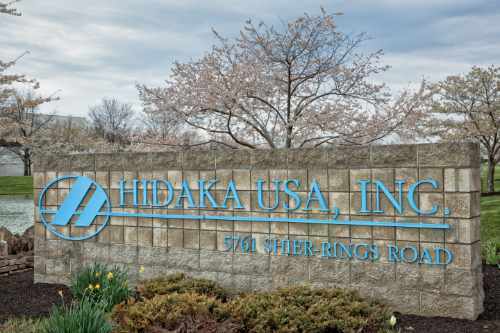 More than 100 cherry trees bloom each spring on the property of Hidaka USA, Inc. For Yoshihiro Hidaka, company President/CEO, the trees promote rebirth and a new beginning. This spirit of ‘new beginnings’ underscores the company’s philosophy of treating each project with renewed vigor. Hidaka USA, Inc. was established in 1989 to fulfill a clearly defined need... to supply customers with higher quality prototypes. We have since expanded our workforce, equipment lineup, technical expertise and infrastructure to support mass production demands. Our customers come from a diverse range of industries, requiring a wide array of parts and assemblies. Contact us today to schedule a meeting to learn how Hidaka USA, Inc. can serve your prototype and/or mass production needs.